In this class we will work on developing and refining clay forming skills with a focus on working with clay using a variety of hand-building techniques, including wood and paper patterns, altering, and assemblage. We will discuss and develop the integration of form and surface for our work, addressing both functional and sculptural intentions. Some wheel work will be optional. The class will be structured for all levels of experience, although some basic ability with ceramics will be helpful. There will be lectures and images that address both historical and contemporary approaches as they apply to the course. The class will work in high fire stoneware clays, and work will be bisque fired only. Through group interaction there will be a spirit of exploration and lively discussion in this class. Randy Johnston has been working in ceramics in his Wisconsin studio for more than forty years. He is recognized internationally as an artist who has pursued functional expression and brought a fresh aesthetic vision to contemporary form, and who has made many contributions to the development of wood kiln technology in the United States. He is currently a professor and department chair at the University of Wisconsin, River Falls, where he teaches ceramics and drawing. His work is exhibited internationally and he is the recipient of numerous awards, including the Bush Artist Fellowship granted by the Bush foundation in Minnesota, and two Visual Artist Fellowships from the National Endowment for the Arts. Randy received his MFA from Southern Illinois University and a BFA in Studio Arts from the University of Minnesota where he studied with Warren MacKenzie. 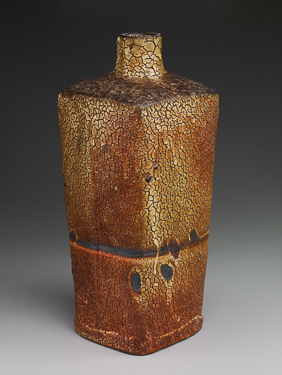 He also studied in Japan at the pottery of Shimaoka Tatsuzo, who was a student of Shoji Hamada. Randy has presented hundreds of lectures and guest artist presentations worldwide. He has work in the permanent collections of the Victoria and Albert, London, Minneapolis Art Institute, Boston Museum of fine Arts, Los Angeles County Museum, Nelson Aitkins Museum, and numerous international public and private collections. As I work in clay, the reality that is the starting point is the choice to investigate the formal range of the vessel (pot) structure in clay, and the belief in the potential that the pieces must entertain, suggest a narrative, and allude to things outside of themselves. The largest question is how to invest my art with life, force, dignity, and a sensibility to the process and material. I am interested in this process as a means to manifest ideas and form. Categories are not important. The ongoing pursuit to enlarge the boundaries of conventional perceptions is essential. After returning from Japan in 1975, I rebuilt my kiIn, incorporating many of the subtle ideas about design that I had learned from the old kiln builders in Mashiko. These refinements had been resolved over hundreds of years of firing pots with wood, sometimes in the same families and locations. My wife Jan McKeachie and I have fired most of our work in our large wood fired Nobori gama (1972-present) or Anagama kiln (2002-present). The architecture of wood kilns makes them wonderful objects - creaking, belching, and breathing. It is an architecture completed by fire and containing the violence out of which living pots emerge. Firing for days with wood creates a complexity of layers and structures on the work and in one’s mind. Awareness of this layering brings me to a sacred place, a memory of a perfect place where we can stop and play with our minds and voices. This space also exists often within the architectural structures of our work as we attempt to define space, design structure, and deal with symbolic interpretations. The complex of social interaction and the place of our humanity within this structure is in large part a continuing expression of my conversation with the material and process of clay.